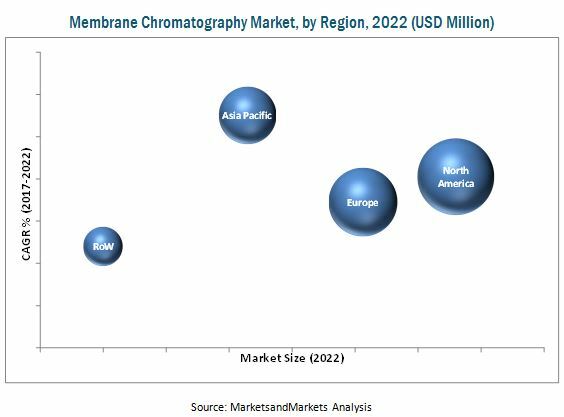 [134 Pages Report] The global membrane chromatography market is projected to reach USD 290.6 Million in 2022 from USD 108.5 Million in 2016, at a CAGR of 18.1%. The base year considered for the study is 2016, and the forecast for the market size is provided for the period between 2017 and 2022. Growth in this market will largely be driven by the increasing demand for biopharmaceuticals, increasing R&D expenditure in the biopharmaceutical industry, significant benefits of membrane chromatography over conventional chromatography methods, and increasing regulatory scrutiny on the cleaning validation of downstream purification processes. Both, top-down and bottom-up approaches were used to validate the size of the global membrane chromatography market and estimate the size of various other dependent submarkets. Major players in the market were identified through secondary research and their market presence was studied through primary and secondary research. Secondary research included the study of the annual and financial reports of top market players, presentations, websites, and press releases of top players, news articles, journals; and paid databases ,white papers, medical journals, certified publications, articles from recognized authors, directories, and databases such as World Health Organization (WHO), National Institutes of Health (NIH), National Center for Biotechnology Information (NCBI), US FDA, Chromatographic Society (ChromSoc), Chinese American Chromatography Association (CACA), European Society for Separation Science, American Association for Laboratory Accreditation (A2LA), and European Free Trade Association (EFTA). Whereas, primary research included extensive interviews with key opinion leaders such as CEOs, vice presidents, directors, marketing executives, and related key executives from various companies. The percentage splits, shares, and breakdowns of the segments were determined using secondary sources and verified through primary sources. This data is consolidated and added to detailed inputs and analysis from MarketsandMarkets and presented in this report. The global membrane chromatography market is projected to reach USD 290.6 Million in 2022 from USD 126.6 Million in 2017, at CAGR of 18.1%. Membrane chromatography is bioseparation technology which is based on the integration of membrane filtration and liquid chromatography into a single-stage operation by using microporous membrane adsorbers with functionalized groups, such as ion exchange groups and/or affinity ligands. Growth in this market will largely be driven by the increasing demand for biopharmaceuticals, increasing R&D expenditure in the biopharmaceutical industry, significant benefits of membrane chromatography over conventional chromatography methods, and increasing regulatory scrutiny on the cleaning validation of downstream purification processes. In this report, the market has been categorized based on product, operation mode, technique, and region. 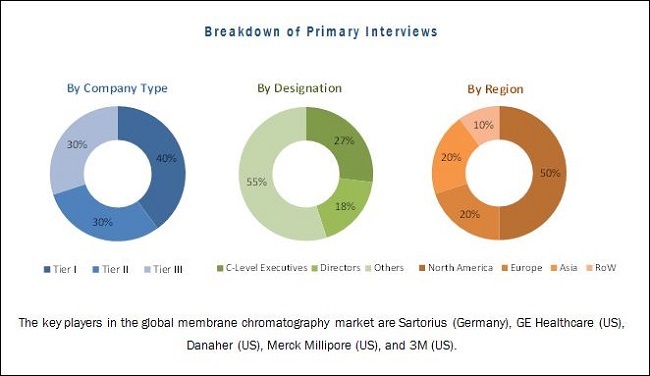 The key players in the global membrane chromatography market are Sartorius (Germany), GE Healthcare (US), Danaher (US), Merck Millipore (US), and 3M Company (US). These players focus on inorganic strategies such as expansions, acquisitions, and collaborations as well as organic strategies such as expansions and product launches to sustain their growth in the global market.